I can't believe that Easter is this week. Each year I make Easter basket's for the kids. One of the hardest tasks is finding stuff to put in a teen boys Easter basket. Girls are super easy to buy for. Between, magazines, clothing, accessories, books, beauty products, and restaurants gift cards. The possibility is truly endless with them. With boys, it can honestly be a different story. I try my best to only purchase items that Michael can use on a daily basis. It's so much easy that way. I also try to create a memo for myself from Valentine's day with items that he might be in need of and/or have shown interest in. Below I'm sharing 10 Easter Basket gift ideas for boys. I hope you've found this post helpful! This post is so helpful! 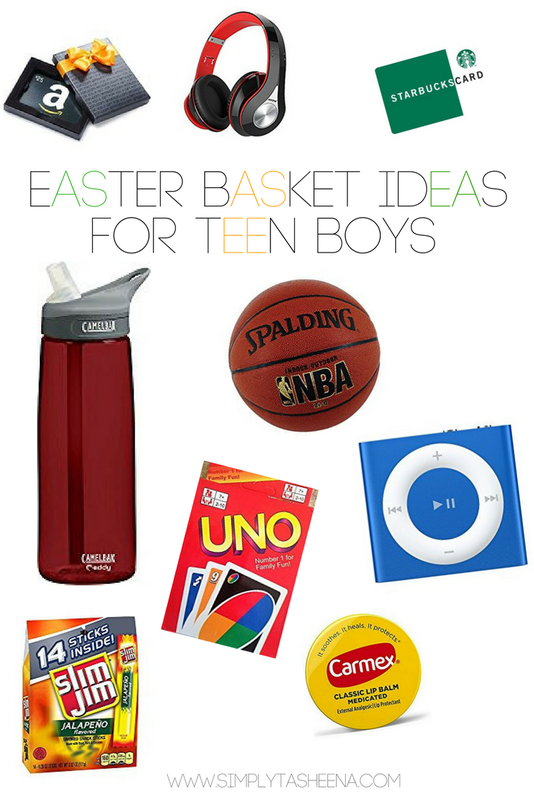 Wonderful basket ideas for teen boys. You have so many great ideas here. I hate getting my tween/teen candy, so I ended up getting them each some gift cards, Celtics gear and mobigos! Shopping for teen boys is no easy feat. Love the idea of the iPod shuffle - they're not too expensive but still a great and reliable electronic! My grandsons would love these basket ideas. They think they're too old for Easter baskets but wouldn't think that if they got some of these items. Now these are some awesome ideas for an easter basket, I find boys so hard to buy from I have to admit. I like the ipod shuffle and headphones idea and I bet every teen boy would do too! These are some great ideas. I have a teenager, and he mostly just gets chocolate and his favorite snacks! You have some terrific ideas in there. As my kids have gotten older we do a little candy and one thing they'll enjoy, such as a gift card, game or headphones. We still do some candy, but we love to throw in a few things that help them work off the candy they ate. We usually throw in something like you have here like a basketball or something. Great ideas here. These are all great ideas for teen boys. Mine is a fan of jerky and peanuts. A chocolate Easter bunny is a must in their Easter baskets. It's about the only candy they expect to be there. Well, that and whatever the latest Peeps flavor is. This year it's pancakes and syrup. These are great ideas. Teen boys are always so hard to buy for. We only have girls, so i would for sure be lost. You know when your kids grown up you miss dressing them up on this kind of occasion. However you can never go wrong giving a gadgets to your teens. I miss the time when I would prepare Easter baskets for my kids. They're not into it now, makes me sad a bit. These are great ideas. I have a tween girl, and I can relate to how tough it can be to shop for this age! Gift cards are a great way to go! Cool Easter basket ideas for the boys! I'm pretty sure they're going to appreciate the items inside. It would be awesome to give them something that they can use! These are some really awesome ideas for things for older boys to have in their basket. I know they would be a huge hit! I got amazing ideas for a 13 Years Old Boy Gifts at UpnNext.com, and it has certainly reminded of my childhood, because I used to be fond of playing video games and listing songs on my walkman.